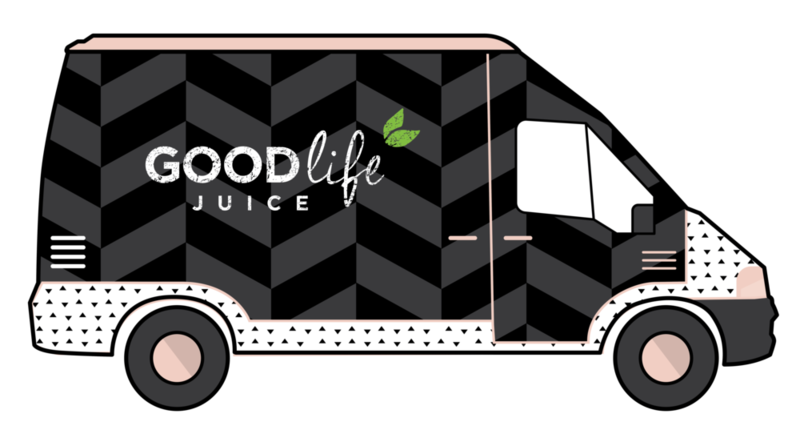 Good Life Juice is the brainchild of Andrea Dershin. Andrea spent the better part of her young adulthood living in world-renowned locations - including Hong Kong and New York City. She trained in plant-based nutrition at Cornell University and is a specialized yoga instructor through Yoga People in Brooklyn, New York. It all started as a hobby. Andrea's husband was a busy New York City DJ - working late into the night / or early morning... He'd often arrive home to find fresh-pressed green juice sitting on the kitchen counter. It was Andrea's way of making sure her hubby was receiving vital nutrients even though his job was demanding. THERE'S NO EASY PEASY WAY TO GET HEALTHY - JUST LIKE THERE'S NO EASY PEASY WAY TO BE BRAVE. Andrea eventually moved back to the west coast with her husband and their two young children. She was craving a more balanced lifestyle but nothing changed when it came to the juice. Between jam-packed family schedules and the common challenge of satisfying picky young children, fresh-pressed juice was still an easy and convenient way to ensure her family got the nutrients they needed to thrive. at the time, there were zero options for cold-pressed juice on vancouver island. people didn't even know what cold-pressed juice was - and i wanted to help them. Andrea's original mission was elementary. Good Life Juice was born from a deep desire to help regular people achieve better health. Andrea set out to develop unique cold-pressed juice recipes so her loved-ones could transition their eating habits more easily - without having to resort to extreme measures. Since those early days in New York City, Andrea's mission has grown into a true love-affair. Good Life Juice has become her life's work. At Good Life Juice, we're not interested in FAD diets. We're not going to promote trendy programs. We don't want you to get super skinny. We don't think you should live at the gym. We really love wine. And chocolate. And we know what works because we're just like you. We're not going to bombard you with unattainable fitness messaging and we're definitely not going to pretend this life is perfect. We believe this life is at GOOD at its gets. And we're here to help you make the most of it. JUICE JUNKIES UNITE. LIVE THE GOOD LIFE. WE DARE YOU. We respect your privacy. We will always keep your personal information safe and sound.